Boo! It's Halloween, and we here at Neurotic Kitchen hope you're looking forward lots of fun activities with your friends and loved ones this creepiest of evenings. Even if your trick-or-treating already happened this weekend, there's still time for a spooky, edible craft that will delight big and little diners alike, with none of the commitment of cupcakes or other more involved baked goodies. You don't even have to turn on the oven. Lay out Parchment or Wax Paper on a work surface. 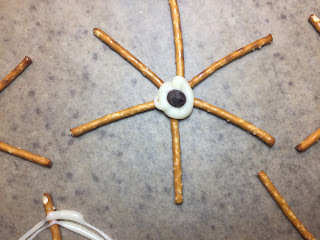 Using 5 or 6 Pretzel Sticks, create your spider web as seen below. When White Chocolate has cooled enough, spoon it into a Ziploc and cut a tiny bit off one of the bottom corners of the bag. You are ready to pipe your web! Start with the middle where the Pretzels meet and make a large blob of White Chocolate to fuse them together. 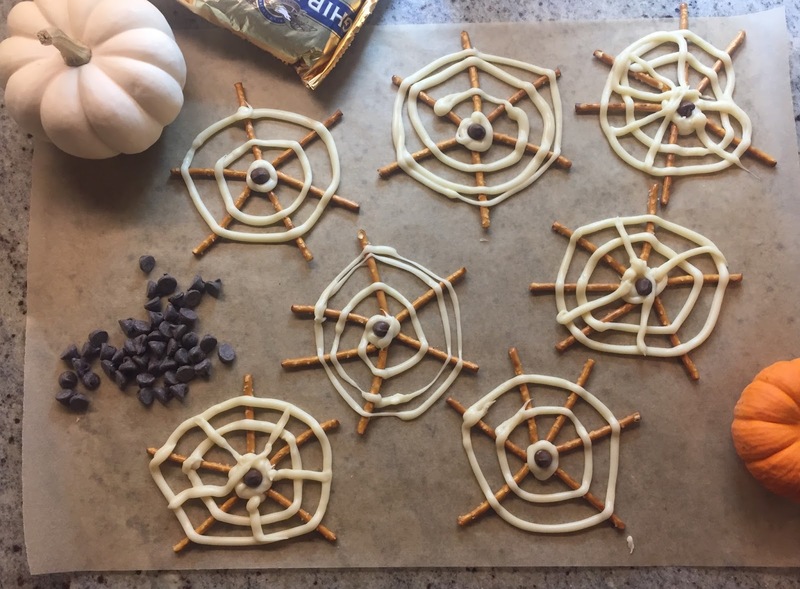 Press a regular Chocolate Chip in to create your Spider. To finish, create the web by piping White Chocolate around in a circular motion according to your desired design. Allow to cool at least 30 minutes, gentle peel away your Wax or Parchment Paper, serve and enjoy!